Direction Island Accommodation - An entire island to yourself! 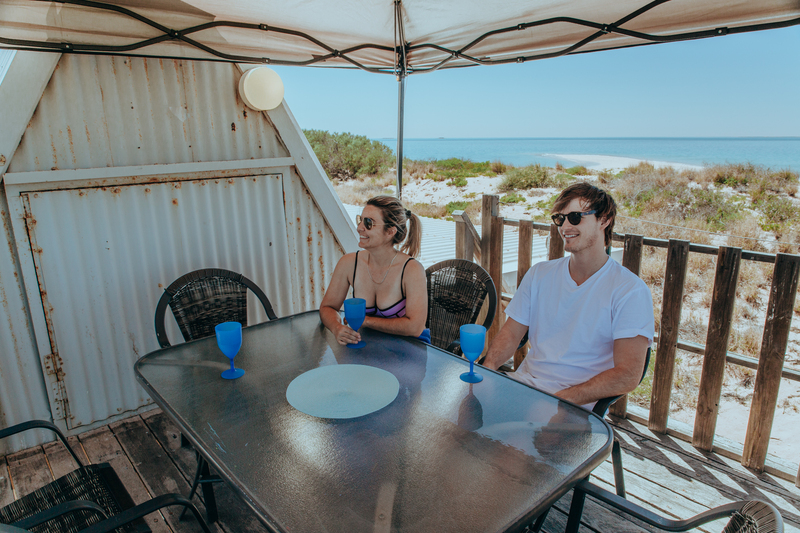 Located a 20 minute boat trip away from the mainland of Onslow in Western Australia, Direction Island is easily accessible. We can drop you off with our ferry transfer or you can arrive with your own private vessel. The accommodation is a sole, self-contained A-frame beach shack with simple home comforts that enhance the opportunity to soak up the beauty of untouched nature, reconnect with the most important people in your life, and truly unravel from any pressures. The ultimate wilderness experience, you’ll have the whole island to yourself, allowing you to play castaway with up to 8 of your family and friends on this rustic little island gem. Pre-order from our Online Grocery Store and take one more item off your ‘to-do’ list. Your order will be delivered to the beach shack in time for your arrival. A sole Beach Shack perched on the beach sand, surrounded by seashells and brush, is the only structure on the island. Rustic and simple, it is self-contained, equipped with a kitchen, dining area, two bedrooms, outdoor bathroom, 180° degree views over the island and Indian Ocean from the upstairs balcony, and all the home comforts you need to experience having an island all to yourself. The cabin features a fully-equipped kitchen (including full size fridge/freezer, separate deep freezer, stove top, oven, microwave, toaster & kettle), dining areas, private outdoor bathroom, ceiling fans, shaded outdoor entertaining area with a Weber BBQ & upstairs balcony deck with ocean views. Direction Island, nestled within its own coral reef and visited by sea turtles, dolphins, whales, colourful fish and stingrays, offers a perfect base to explore the amazing natural wonders of the surrounding waters, whether your interests are diving, fishing, bird watching, stargazing, beachcombing, or just plain relaxing. Discover how to get to Direction Island, part of the Mackerel Islands group made up of 10 islands and atolls scattered off the mid-coast of Western Australia. For private vessels under 6m in length, there is a boat mooring available for guests. Detailed boating information is here. Ferry transfers between Onslow and Direction Island operate on these days or upon request.